Focusrite, international leader in audio interface design, and Emmy® Award-winning plug-in developer McDSP have partnered to deliver an unprecedented interface and plug-in bundle. All registered customers of a Focusrite Red 4Pre, Red 8Pre or Red 16Line Thunderbolt™ and Pro Tools | HD™ audio interface will receive a free 12-month subscription to McDSP’s All Access HD plug-in pack, worth $499.99. Including 24 of their industry-acclaimed plug-ins for AAX DSP, AAX Native, AU, VST and VST3 applications, McDSP’s All Access pack features dynamics, EQ, reverb, virtual tape machines and modulation plug-ins to help you deliver the finest sounding, professional quality mixes. It’s the ideal package for the engineer who needs a wide palette of powerful plug-ins to effortlessly get the sounds they are looking for. It even includes the SA-2 Dialog Processor that McDSP just received an Emmy for. Focusrite’s Red interfaces offer the utmost flexibility with connectivity to Pro Tools | HD via DigiLink™, and Core Audio via Thunderbolt, all without the need for option cards. The same can be said about McDSP’s plug-ins, with support for every major DAW whether native- or DSP-based. It’s this synergy that Red Product Manager Will Hoult highlights is key. “I’ve long admired the McDSP plug-ins particularly since the products were expanded to include AU and VST support. The fact that we can now offer our clients the combination of a superb interface with a class-leading plug-in pack, both of which are transferable between software applications, is amazing”. For more information on McDSP, please visit http://www.mcdsp.com. 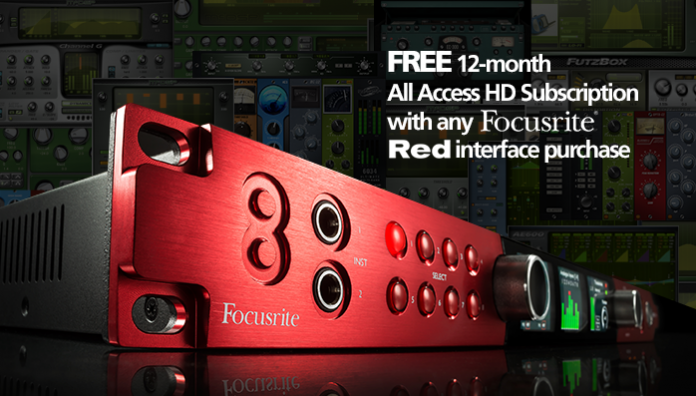 For more information on Focusrite Red interfaces, please visit http://www.focusrite.com/red-range.